Dozens of lawmakers defected from President Park Geun-hye’s governing Saenuri Party on Tuesday over the corruption scandal involving Park and her aides, pledging to create a new conservative party in the run-up to next year’s presidential election. The departure of 29 anti-Park lawmakers left Saenuri with 99 parliamentary seats, making it the second-largest party in the National Assembly. The main opposition Democratic Party of Korea has now emerged as the biggest political party with 121 seats. The People’s Party is third with 38 seats. The conservative party’s split marks a turning point for South Korean politics as it witnesses four major parties competing for power for the first time since 1990. At that time, there were two conservative and two liberal parties until they realigned into one big conservative and one minor liberal party. “We will begin our journey to play a pivotal role for the conservatives and provide them with orderly and stable reform. We will preserve liberal democracy, achieve social unification and create a warm community,” said the defectors in a statement. A total of 30 lawmakers joined the new party, including 29 defectors and Rep. Kim Yong-tae, who had already left Saenuri in late November. 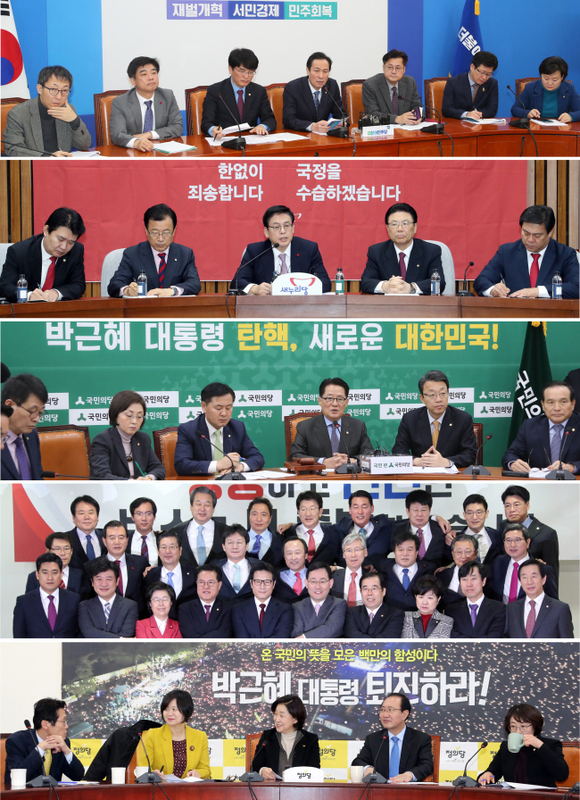 Last week, 35 Saenuri members vowed to leave the party, but some withheld their decision at the last minute to consult with their constituents. The lawmakers said that they will launch a new party named “New Conservative Party for Reform” on Jan. 24. Later in the day, the new party registered themselves as a parliamentary negotiating group, who can receive a government subsidy and exercise tie-breaking votes between the major parties. Their rebellion against Saenuri came after most anti-Park lawmakers joined opposition parties in passing the impeachment motion against the president earlier this month. Up to 62 Saenuri lawmakers are thought to have approved the motion in a secret ballot. Since then, they have clashed over control of the party with the pro-Park faction, who dominated leadership positions. The factional feud ended in favor of the pro-Park faction when one of Park’s loyalists was elected as the new floor leader on Dec. 16. “The mass defection which claims to advocate reform was in fact a pursuit of political ambition and a move to salvage (anti-Park) faction,” said Saenuri floor leader Chung Woo-taik, dismissing the defection as a “failure” because anti-Park lawmakers failed to attract the 35 lawmakers they had initially promised. 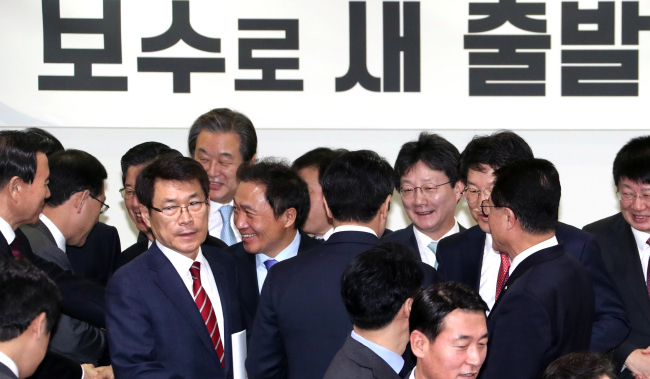 The defection group includes a number of former Saenuri heavyweights, such as former Saenuri leader lawmakers Rep. Kim Moo-sung and former Floor Leader Rep. Yoo Seong-min. Both had clashed with Park over her welfare policies and nominations for the 2016 general election. There are other high-profile legislators working at parliamentary committees. Among them are third-term lawmaker Rep. Kweon Seong-dong, chairman of the Legislation and Judiciary Committee who will represent the legislative body during the impeachment trial against Park at the Constitutional Court. The defectors said that more Saenuri lawmakers would quit the party once UN Secretary-General Ban Ki-moon joins them to run for the 2017 presidential race. The world’s top diplomat has distanced himself from President Park and her loyalists since the corruption scandal erupted in October. “I don’t want to make a move until Ban returns to Korea,” said former Saenuri Floor Leader Rep. Chung Jin-suk, who is considered close to Ban, who is expected to return to Korea in mid-January. Chung succeeded Yoo for the post in 2016. It was not the first time that conservative parties have split up before presidential elections. In 1997, former Gyeonggi Province Gov. Rhee In-je left the then-ruling New Korea Party to rebel against Lee Hoi-Chang, a presidential candidate then. Lee also defected from his party to run for the 2007 presidential race. For the Saenuri defectors to avoid the same fate as their conservative predecessors, experts said, they have to move beyond opposition of the president and focus on showing conservative voters policies tailored to them. Myongji University politics professor Kim Hyung-joon said that the anti-Park lawmakers’ defections could expand their appeal to independent centrists if they focus on political reform, rather than rallying behind establishment powerbrokers.